How Is a Satellite Launched Into an Orbit? All satellites today get into orbit by riding on a rocket. Many used to hitch a ride in the cargo bay of the space shuttle. Several countries and businesses have rocket launch capabilities, and satellites as large as several tons make it into orbit regularly and safely. After a rocket launches straight up, the rocket control mechanism uses the inertial guidance system (see sidebar) to calculate necessary adjustments to the rocket's nozzles to tilt the rocket to the course described in the flight plan. In most cases, the flight plan calls for the rocket to head east because Earth rotates to the east, giving the launch vehicle a free boost. The strength of this boost depends on the rotational velocity of Earth at the launch location. The boost is greatest at the equator, where the distance around Earth is greatest and so rotation is fastest. Considering that rockets can go thousands of miles per hour, you may wonder why a difference of only 144 mph would even matter. The answer is that rockets, together with their fuel and their payloads, are very heavy. For example, the Feb. 11, 2000, liftoff of the space shuttle Endeavour required launching a total weight of 4,520,415 pounds (2,050,447 kilograms) [source: NASA]. It takes a huge amount of energy to accelerate such a mass to 144 mph, and therefore a significant amount of fuel. Launching from the equator makes a real difference. Once the rocket reaches extremely thin air, at about 120 miles (193 kilometers) up, the rocket's navigational system fires small rockets, just enough to turn the launch vehicle into a horizontal position. The satellite is then released. At that point, rockets are fired again to ensure some separation between the launch vehicle and the satellite itself. A rocket must be controlled very precisely to insert a satellite into the desired orbit. An inertial guidance system (IGS) inside the rocket makes this control possible. The IGS determines a rocket's exact location and orientation by precisely measuring all of the accelerations the rocket experiences, using gyroscopes and accelerometers. Mounted in gimbals, the gyroscopes' axes stay pointing in the same direction. This gyroscopically stable platform contains accelerometers that measure changes in acceleration on three different axes. If it knows exactly where the rocket was at launch and the accelerations the rocket experiences during flight, the IGS can calculate the rocket's position and orientation in space. A rocket must accelerate to at least 25,039 mph (40,320 kph) to completely escape Earth's gravity and fly off into space (for more on escape velocity, visit this article at NASA). Earth's escape velocity is much greater than what's required to place an Earth satellite in orbit. With satellites, the object is not to escape Earth's gravity, but to balance it. Orbital velocity is the velocity needed to achieve balance between gravity's pull on the satellite and the inertia of the satellite's motion -- the satellite's tendency to keep going. This is approximately 17,000 mph (27,359 kph) at an altitude of 150 miles (242 kilometers). Without gravity, the satellite's inertia would carry it off into space. Even with gravity, if the intended satellite goes too fast, it will eventually fly away. On the other hand, if the satellite goes too slowly, gravity will pull it back to Earth. At the correct orbital velocity, gravity exactly balances the satellite's inertia, pulling down toward Earth's center just enough to keep the path of the satellite curving like Earth's curved surface, rather than flying off in a straight line. The orbital velocity of the satellite depends on its altitude above Earth. The nearer to Earth, the faster the required orbital velocity. At an altitude of 124 miles (200 kilometers), the required orbital velocity is a little more than 17,000 mph (about 27,400 kph). To maintain an orbit that is 22,223 miles (35,786 kilometers) above Earth, the satellite must orbit at a speed of about 7,000 mph (11,300 kph). That orbital speed and distance permit the satellite to make one revolution in 24 hours. Since Earth also rotates once in 24 hours, a satellite at 22,223 miles altitude stays in a fixed position relative to a point on Earth's surface. Because the satellite stays right over the same spot all the time, this kind of orbit is called "geostationary." Geostationary orbits are ideal for weather satellites and communications satellites. In general, the higher the orbit, the longer the satellite can stay in orbit. At lower altitudes, a satellite runs into traces of Earth's atmosphere, which creates drag. The drag causes the orbit to decay until the satellite falls back into the atmosphere and burns up. At higher altitudes, where the vacuum of space is nearly complete, there is almost no drag and a satellite like the moon can stay in orbit for centuries. A launch window is a particular period during which it will be easier to place the satellite in the orbit necessary to perform its intended function. With the space shuttle, an extremely important factor in choosing the launch window was the need to bring down the astronauts safely if something went wrong. The astronauts had to be able to reach a safe landing area with rescue personnel standing by. For other types of flights, including interplanetary exploration, the launch window must permit the flight to take the most efficient course to its very distant destination. If weather is bad or a malfunction occurs during a launch window, the flight must be postponed until the next launch window appropriate for the flight. If a satellite were launched at the wrong time of the day in perfect weather, the satellite could end up in an orbit that would not pass over any of its intended users. Timing is everything! In this artist's interpretation, Landsat checks out the eye-catching view below. Not so long ago, satellites were exotic, top-secret devices used primarily in a military capacity, for activities such as navigation and espionage. Now they're an essential part of our daily lives. We see and recognize their use in weather reports. We watch television signals transmitted by DIRECTV and the DISH Network. We have GPS receivers in our cars and smartphones to help us find our way to any destination. And we marvel at images captured by the Hubble Space Telescope and by antics of astronauts living on the International Space Station. Even still, many satellites escape our notice. Let's meet a few of these unsung orbiting heroes. Landsat satellites have been snapping images of Earth since the early 1970s, offering the longest continuous global record of our planet's surface. Landsat 1, known at the time as the Earth Resources Technology Satellite (ERTS), was launched on July 23, 1972. It carried two primary instruments -- a camera built by RCA and a multispectral scanner, courtesy of Hughes Aircraft Company, capable of recording data in green, red and two infrared bands. The satellite produced such amazing images and was considered so successful that it was followed by a series of companions. NASA launched the most recent addition, Landsat 8, on Feb. 11, 2013. The device contains two Earth-observing sensors, the Operational Land Imager (OLI) and the Thermal Infrared Sensor (TIRS), which collect multispectral images of coastal regions, polar ice, islands and the continents. Geostationary Operational Environmental Satellites (GOES) circle Earth in geosynchronous orbits, each hovering over a fixed area of the globe. This allows the satellites to keep a watchful eye on the atmosphere and detect changing weather conditions that could lead to tornadoes, hurricanes, flash floods and thunderstorms. Meteorologists use the information to issue watches and warnings for severe weather. They can also use GOES imagery to estimate rainfall amounts and snowfall accumulations, measure the extent of snow cover and track movements of sea and lake ice. Since 1974, 15 GOES satellites have been placed in orbit, but at any one time, it takes two of the devices -- GOES East and GOES West -- to see Earth's weather. Jason-1 and Jason-2 have played key roles in long-term analysis of Earth's oceans. NASA launched Jason-1 on Dec. 7, 2001, to take over duties provided by the NASA/CNES Topex/Poseidon satellite, which had been circling Earth since 1992. For almost 12 years, Jason-1 mapped sea level, wind speed and wave height for more than 95 percent of Earth's ice-free oceans. The mission revolutionized the study of ocean circulation and provided data to indicate that sea levels across the planet were rising. NASA officially decommissioned Jason-1 on July 3, 2013, but that didn't stop the ocean-gazing operations. In 2008, the space agency launched a successor to Jason-1 from Vandenberg Air Force Base in California. Jason-2 carries high-precision instruments to measure the distance between the satellite and the ocean surface to within a few centimeters. These measurements of ocean topography arm scientists with information about how fast ocean currents are moving and how much heat is stored in the ocean. This data, in turn, provides insights into global climate patterns. The 66 Iridium communications satellites orbiting 500 miles (800 kilometers) above Earth's surface have created a stir on many fronts. Iridium LLC, the original owner of the satellites, spent $5 billion to build and deploy the machines, then sold them for $25 million in 1999 when the company went bankrupt. Then, in 2009, Iridium 33 collided with a decommissioned Russian satellite over Siberia, creating a large field of space junk and debris that will remain in orbit for years to come. Today, Iridium Communications Inc. owns and operates the satellites, which allow subscribers to use satellite phones to communicate from any point on the globe. Stargazers also enjoy Iridium because the satellites in the "constellation" are easy to spot, especially when their antenna arrays catch sunlight and flare up brightly in the night sky. The OSCAR (Orbiting Satellite Carrying Amateur Radio) series of satellites facilitate communication between amateur radio stations. They're built and operated by a nonprofit organization of ham radio operators worldwide known as AMSAT. The AMSAT-built satellites "hitch" a rocket launch on a "payload-space-available" basis. For this reason, the devices are usually quite small and have no propulsion systems that could interfere with the rocket's primary payload. AMSAT satellites can often be heard by use of a shortwave receiver or aradio scanner. Ham operators make use of the satellites during natural disasters when terrestrial links and cell phone systems may be down or overloaded. Space telescopes are satellites that look away from Earth. From their orbits high above our atmosphere, they can view the universe without any distortions or interference. You've undoubtedly seen some of the spectacular images beamed down from the Hubble Space Telescope (HST), which entered its orbit, 308 miles (570 kilometers) above Earth, in 1990. HST has a very elaborate control system so that the telescope can point at the same position in space for hours or days at a time (despite the fact that the telescope travels at 17,000 mph/27,359 kph!). The system contains gyroscopes, accelerometers, a reaction wheel stabilization system, thrusters and a set of sensors that watch guide stars to determine position. In 2018, NASA plans to launch a companion to Hubble -- the James Webb Space Telescope (JWST). JWST will observe infrared light from very distant objects and will do it from a special elliptical orbit, known as L2, located 932,000 (1.5 million kilometers) away from Earth! How Much Do Satellites Cost? 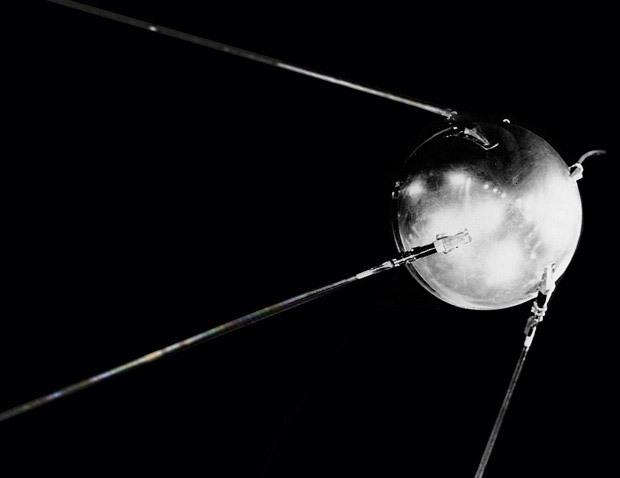 In the years following Sputnik and Explorer 1, satellites grew larger and more complicated. Consider TerreStar-1, a commercial satellite designed to provide mobile voice and data communications in North America to smartphone-size handsets. Launched in 2009, TerreStar-1 weighed in at 15,233 pounds (6,910 kilograms). And when it was fully deployed, it unfurled an S-band antenna measuring 60 feet (18 meters) across and massive solar panels giving the final device a wingspan of 106 feet (32 meters) [source: de Selding]. Building such a complex machine requires lots of resources, which is why, historically, only government agencies and corporations with deep pockets have been able to get into the satellite business. Much of the cost is wrapped up in the equipment carried by a satellite -- transponders, computers and cameras. A typical weather satellite carries a price tag of $290 million; a spy satellite might cost an additional $100 million [source: GlobalCom]. Then there's the expense of maintaining and repairing satellites. Companies must pay for satellite bandwidth just like cell phone owners must pay to transmit voice and data. Those bandwidth costs could top $1.5 million a year [source: GlobalCom]! Despite the costs and risks associated with building, launching and operating satellites, some companies have managed to grow their space technology business. Boeing is one of those companies. Its Defense, Space and Security division managed to deliver 10 satellites in 2012 and acquire orders for seven more, contributing to the business unit's nearly $32 billion in revenue [source: The Boeing Company]. How Can I See an Overhead Satellite? There goes the International Space Station as it passes over Bow Lake in Banff, Alberta, Canada, on Aug. 20, 2011. This photo is a mosaic of five 40-second exposures with gaps in the trail caused by one-second intervals between frames. An Iridium flare also pierced the ISS trail. First, you can spot satellites without any instrument at all, but it helps to have a good pair of binoculars. After that, it's a matter of going out at the right time -- just after sunset or just before sunrise, when it's dark on the ground but the sun's rays still reach the lofty altitudes where satellites reside. Choose a chair that allows you to recline comfortably and orient it so you can see a wide expanse of the sky. It doesn't matter which direction you face. Sweep slowly across the sky, pausing occasionally to focus on one area. If you're patient, you'll soon be able to spot a bright point of light moving slowly against the backdrop of stars. You can't really confuse satellites with meteors or airplanes because the former streak rapidly across the sky before burning out and the latter are usually accompanied by blinking lights and engine noise. Satellites move steadily and intently, often taking three to five minutes to travel from one horizon to the other. You can expect to see 10 to 20 satellites in the hour after twilight. They often travel west to east, but a few move north to south or south to north. These could be surveillance satellites used to spy on other countries. If you want to get more serious, you can try to predict when a specific satellite will be passing overhead. Special satellite software, available for personal computers, predicts satellite orbits. The software uses Keplerian data to forecast each orbit and shows when a satellite will be overhead. The latest "Keps" are available on the Internet for a number of popular satellites. Satellites use a variety of light-sensitive sensors to determine their position. The satellite transmits its position to the ground station. Of course, no "sat-seeing" expedition would be complete without a glimpse of some special satellites. Tumbling spacecraft are one such treat. These are typically dead satellites that remain in orbit but now spin around one or more axes. As they rotate, their surfaces reflect sunlight, making the objects appear to flash as they move across the sky. Satellites in the Iridium constellation can also provide a similar experience. The so-called Iridium flares occur because each satellite has an unusual six-sided shape that readily bounces light toward Earth-based observers. A single flare can glow with an apparent magnitude much greater than Venus. The International Space Station (ISS), because of its massive size, also glows as brightly as Venus or Jupiter. But it can be challenging to see because it stays close to the horizon and passes through "spells of visibility" -- times when it's easier to spot than others. Sources like Heavens Above can tell you when and where to look to catch a glimpse of the ISS. You will need your coordinates for longitude and latitude, available from theU.S. Geological Survey, and an accurate measure of the time. For more information on satellites and related topics, check out the links on the next page.